Eight days. 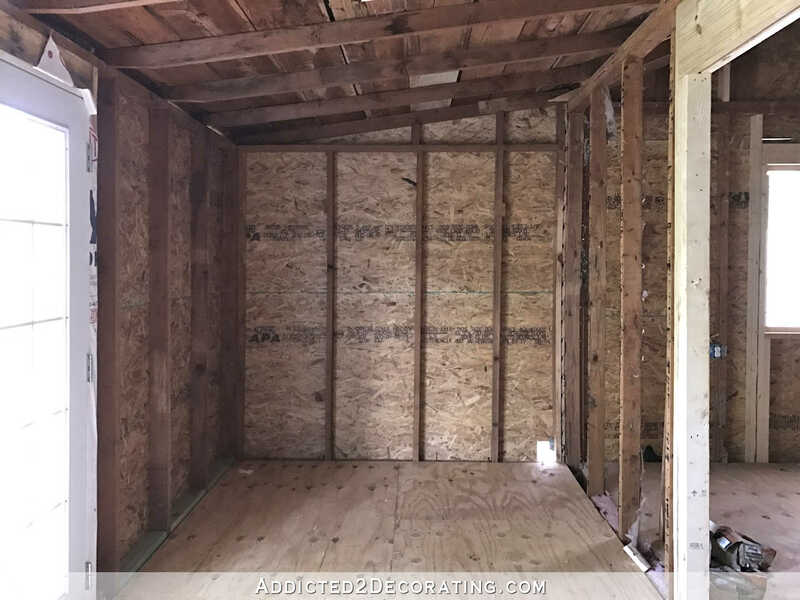 That’s how long it took the framers to completely reframe my garage and turn it into something that looks absolutely nothing like a garage. That amazes me. Had I tried to tackle this as a DIY project with my brother’s help, it would have taken us probably eight months to get to this point. Right about now, we’d probably still be debating exactly how to go about raising the floor up to be level with the breakfast room. We’d be neck deep in scrapped drawings, graphs, charts, diagrams, and supply lists, with absolutely nothing actually accomplished. As of Friday afternoon, everything is framed. Only two things remain to be done before this project is handed over to me to finish out. First, the new windows (which should be here today, but possibly tomorrow) need to be installed. And finally, the plumber still needs to do the plumbing rough-in in the bathroom. I was thinking this morning that we’ve reached the halfway point in this project, but that’s probably a bit too optimistic. It’s probably more accurate to say we’re about a third of the way through. 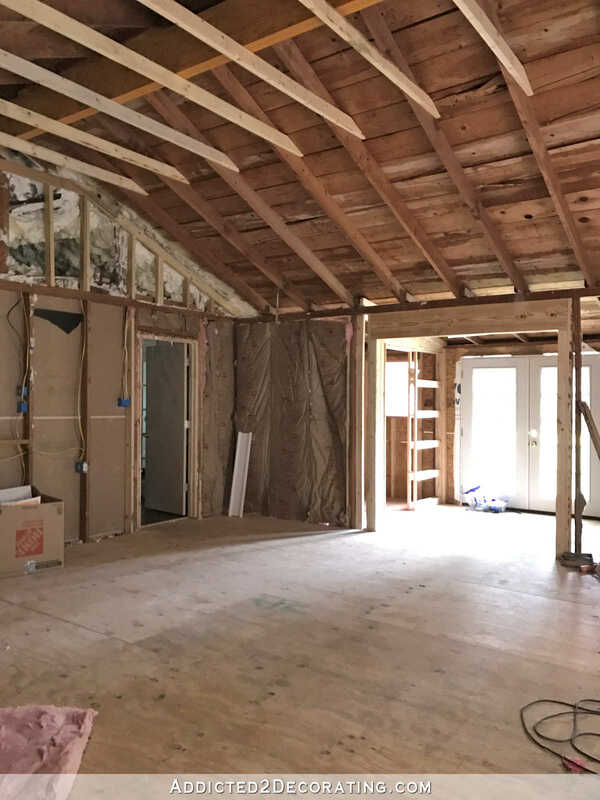 All of the framing, windows, and plumbing rough-in is the first third. 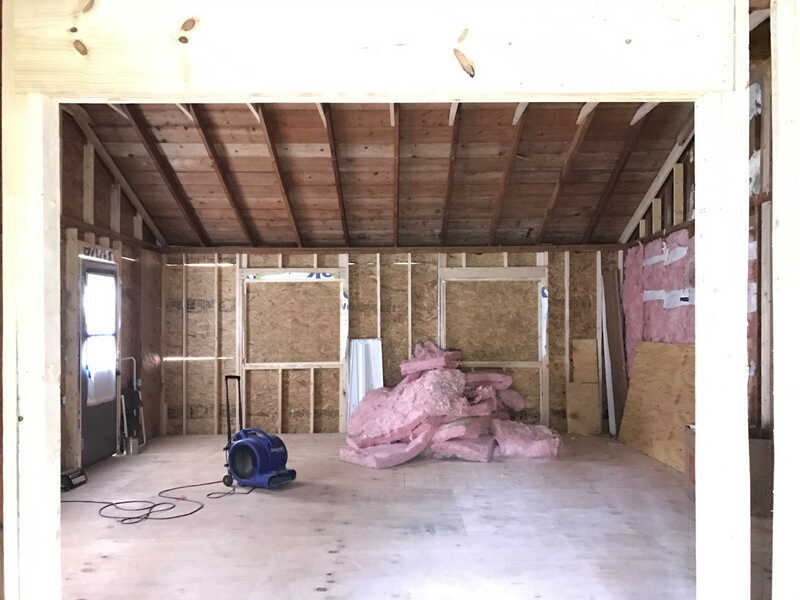 The second third will be the electrical, drywall, flooring, and trim. And the final third will be all of the cabinet building and decorating. So since we’re through the first third of the project, I thought it would be a good time to look back and see just how far this has come in such a short time. I actually didn’t take many pictures of the garage right after we bought the house. I regret that now, but at the time I had no idea we’d be doing a garage conversion. I had thought that it would always stay a garage/workshop for me, and I really didn’t have any grand plans for it. 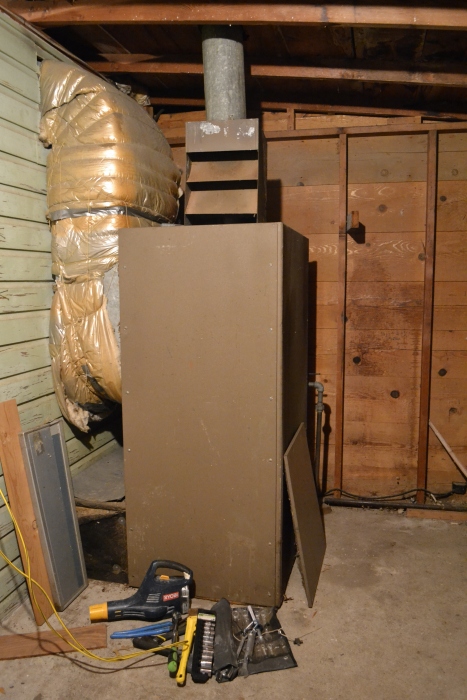 But I did get three pictures of the original garage and storage room. This first picture shows the view standing at the front of the garage (at the garage doors) and looking towards the back of the garage. 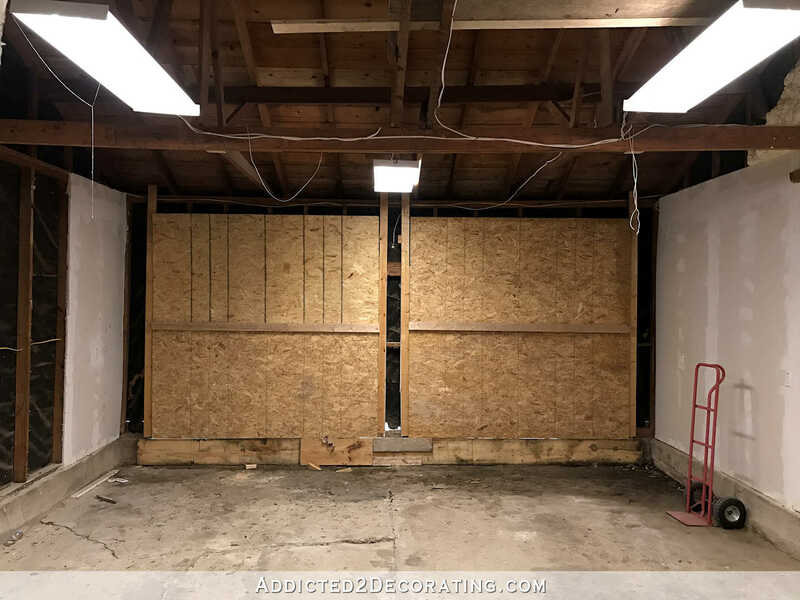 The door on the left goes into what’s now the breakfast room, and the door in the center of the picture goes into what was a storage room at the back of the garage. You can see the old, massive furnace ductwork on the ceiling above the breakfast room door, and the old water heater in the right corner of the garage. There was a big pile of insulation in my way, so I wasn’t able to get back as far as I did in that original picture to get the breakfast room door. But it’s just out of view on the left side. The middle door has been removed, and the cased opening has been widened. 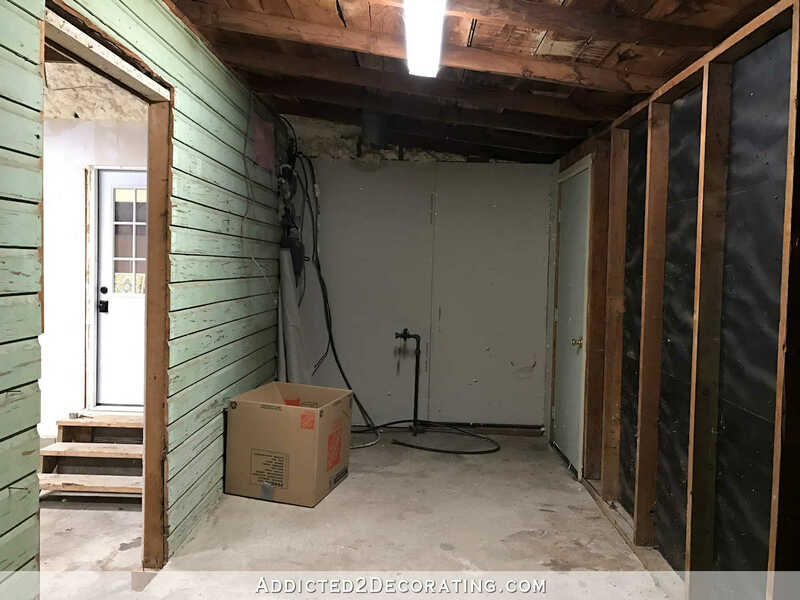 What was a dark, cavelike storage room is now a bright area (thanks to my new French doors) with a half bathroom on the left and what will be a mudroom on the right. And this is the second of three pictures I got of the garage right after we moved in. For this picture, I was standing in the breakfast room doorway, which is why the garage floor looks so far down. The garage floor was about 18 inches below the floor in the house and the storage room, so you had to go down steps into the garage, and then go up steps into the storage room at the back of the garage. And that view now looks like this. 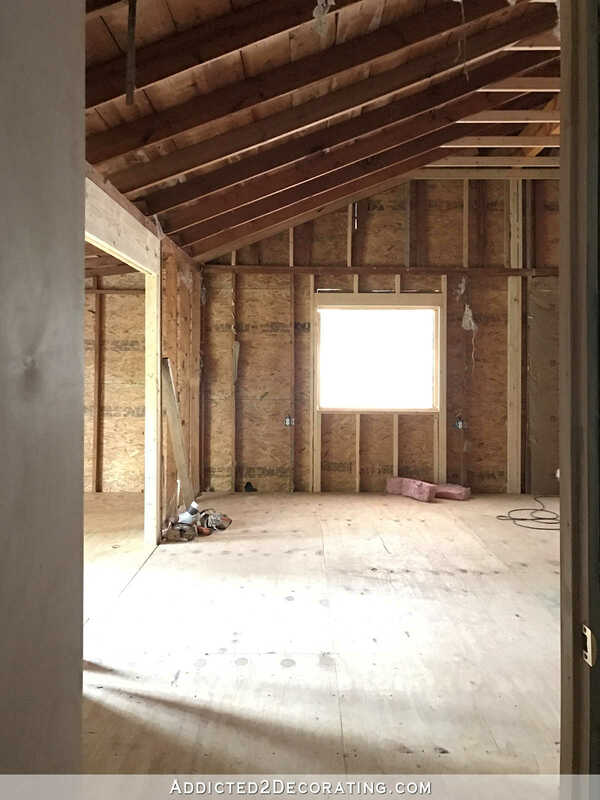 The framed window with the plywood insert is where the closed garage door is in the picture just above. And the final original picture I have is of the side of the storage room that held the massive (and scary) furnace that we used the first winter we were here. It’ll be a half bathroom with just a toilet and sink, as well as a small window. And it’s framed for a pocket door to save space. The rest of the “before” pictures I have of the garage were taken right before this project started, which is fine, but it’s not how the garage looked when we moved in. 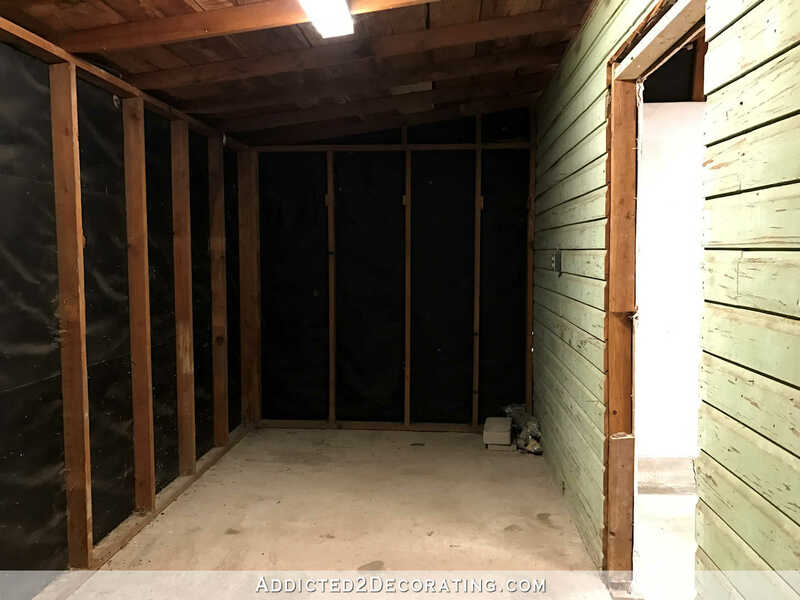 The original garage didn’t have drywall, so all you could see on the walls was black tar paper, which made the whole thing feel like a cave. 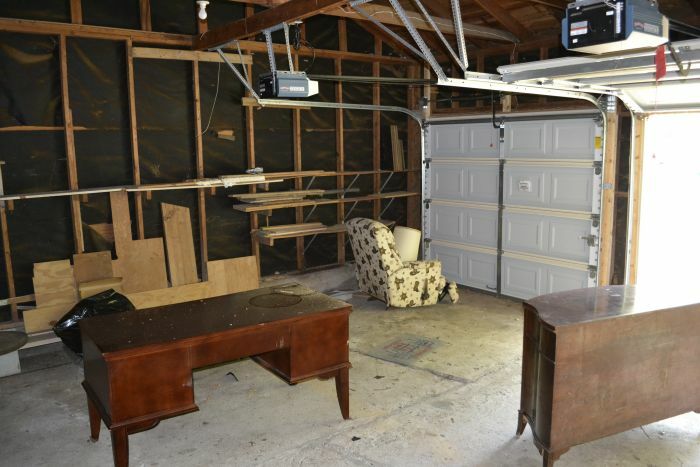 I’m not sure how many (if any) electrical outlets it had, and it only had one single light bulb to light the entire garage. 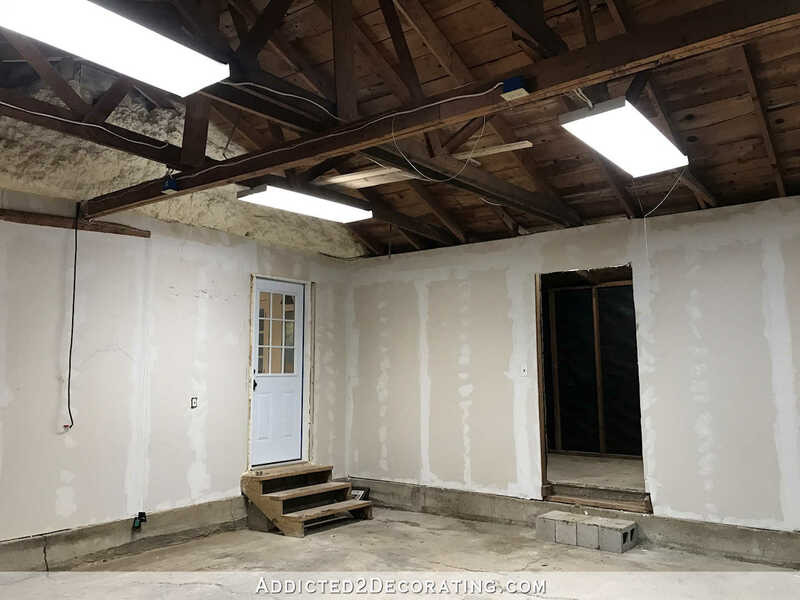 Over the last three years, my father-in-law helped me install new lighting and drywall in the garage, which went a long way towards making it lighter and brighter (and far less scary at night). But the difference in those pictures I took right before this project started and the pictures from today is still very drastic. Here’s what the view straight ahead from the breakfast room door used to look like…kind of. 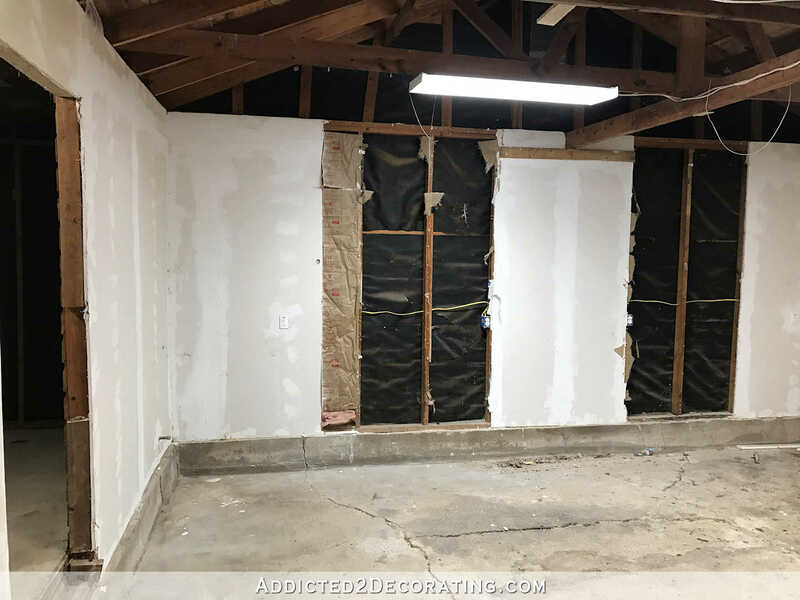 They had already removed the storage room door and cut away the drywall for the window and door on this wall, but you can still get an idea of how it looked. And here it is now. This area straight ahead is where my “office” area will be. And now it looks like this. It’ll eventually be a mudroom with a bench, cabinets, and hooks for coats, etc. Eight days. I’m still amazed. It’s still not pretty to look at, and it’ll be a while before we get to the pretty stuff, but I’d say this is a pretty amazing start to this project! 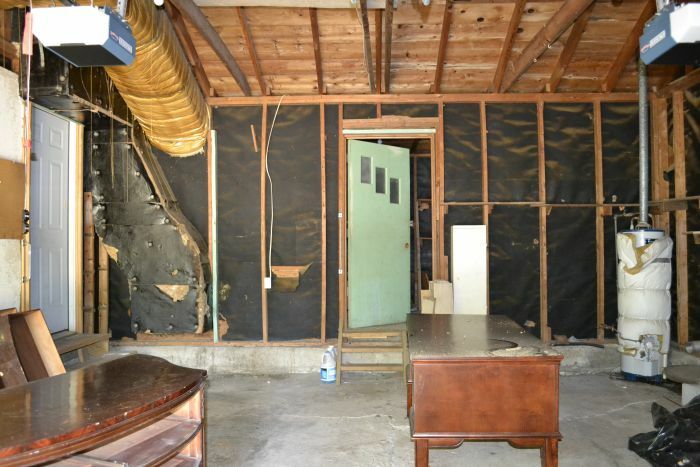 Wow – even with some of the windows still covered there’s SO much light in there now! 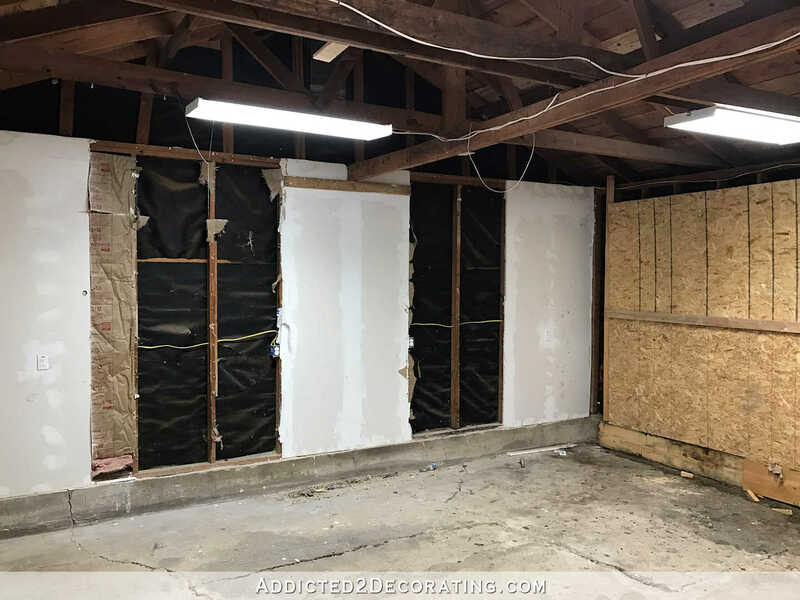 Am really enjoying following along with the progress on your studio conversion. Check each morning to see if there’s a new episode…er… installment in the story! It’s looking great,looking forward to seeing the progress! Amazing! So excited to see where you take it from here! Will you be still putting in skylights? No, I scrapped the skylights. Last week when they were working in here and had all of the windows and doors uncovered, it was SO bright in this room! I’m afraid that skylights would not only make the room too hot, but would also put patches of sunlight right on my office desk area, which could be unbearable. And I keep hearing (from framers, from contractors, etc) how much they hate skylights because of all of the potential problems down the road with them. I had a skylight over my dining room table in a previous home. Not only did it fade my wood table, but every time we had a good rain storm the skylight leaked onto my table. Amazing! Love watching this. Did you decide on AC? Not yet. I’m still waiting on a bid from the second HVAC guy. He came late Friday afternoon, and he seemed to have a completely different plan for a central HVAC unit that wouldn’t require furrdowns on the already low ceiling in the back room. I’ll make a final decision once I get his bids. I disagree that “it isn’t pretty yet”. I think it is beautiful and amazing! But of course I love watching carpentry and here you can clearly see how their skills improved the space so drastically! Wow! Again, you have done a masterful job planning out this space! This is looking really great! What kind of problems could you be having with the contractors? This is an amazing amount of work in such a short time. Wow, what an improvement! I probably missed a post but what are you going to do with the room in the house that you were going to use as your office originally? Matt is moving his game room to her previous office area and his current game room will be the new guest room! Progress is so exciting and invigorating, isn’t it? I can’t get over what a different vaulting your ceiling did for making this big space feel so open! Such an amazing transformation already! This is going to be such an awesome part of your home and we’re excited to be following it all come together. Get Kristi, will you have the contractor out up the sheet rock once electrical is in place? “Lifting” the ridge beam and cleaning up the roofing support system is, to me, the most impressive aspect of the work done. 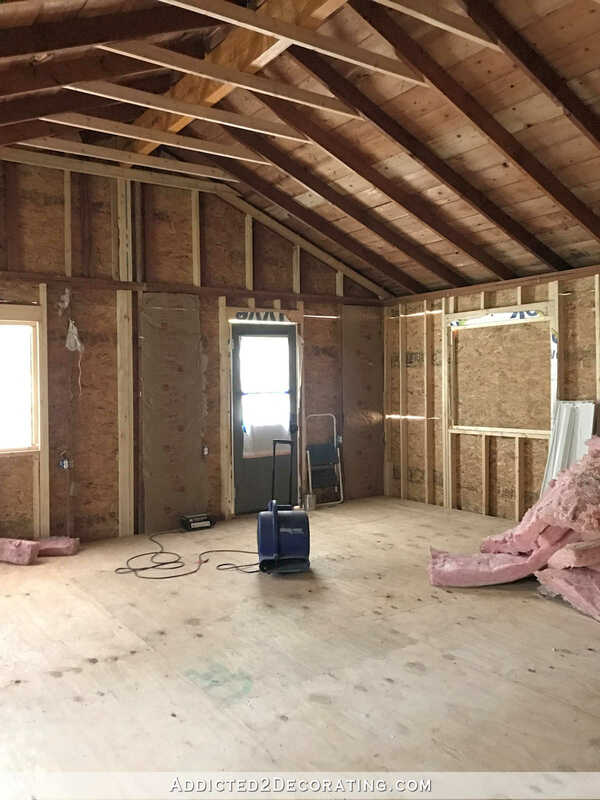 Are you going with the spray foam insulation in the ceiling? If so, that will have a huge impact on your cooling requirements. I was going to ask the same about the insulation. Hope you’re subbing the drywall out also. Are they going to do the siding on all your new walls including the breakfast room ? 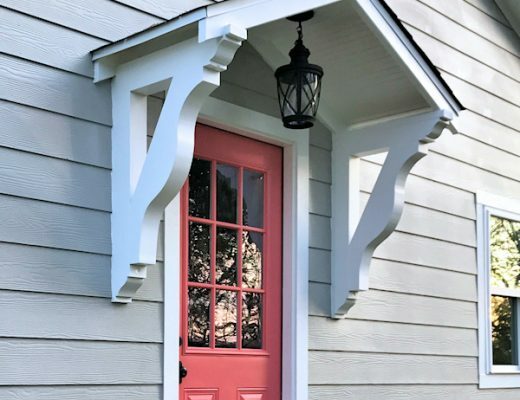 Did you decide on a siding color yet ? So proud to see this part of the job moving so quickly. So happy for you and Matt. I hope your shoulder is healing well. This will be amazing! I can’t imagine having such a nice big workshop studio like that. That is really exciting! Since this is a studio area I would put a utility sink in the half bath. Would be useful if it were my place. I’m always needing a large sink for projects I get into. I did a double take on the floor. I mean, you clearly pointed out it was an 18″ drop, but still, such a nice smooth transition now! Plus I imagine it will be much easier for Matt to come in and out now as well, always an added bonus! What a great space. Really looking forward to following the progress. Question. Are you installing some sort of vac system for saw dust or sanding? I got a vision of your office area covered with sawdust. Looking great and so glad you hired it out! The transformation is truly amazing! 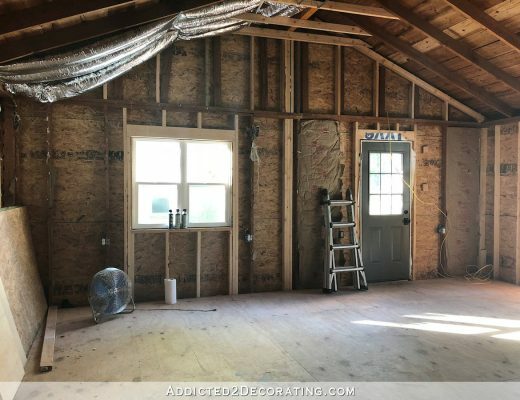 Just like the breakfast room, you (and the contractors) are taking a room that looks ramshackle and falling down and making it into a substantial, sturdy, well-built home! And those french doors are just amazing – so much light! So excited for you! Wow, the rooms look great already and the finish work hasn’t even begun; lots of great space. What a wonderful transformation from garage to Studio. Looking forward to watching it all come together. 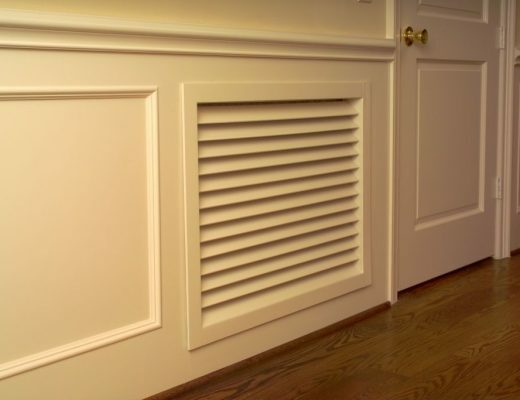 It looks like your contractors worked out great! It’s a light and airy room already. 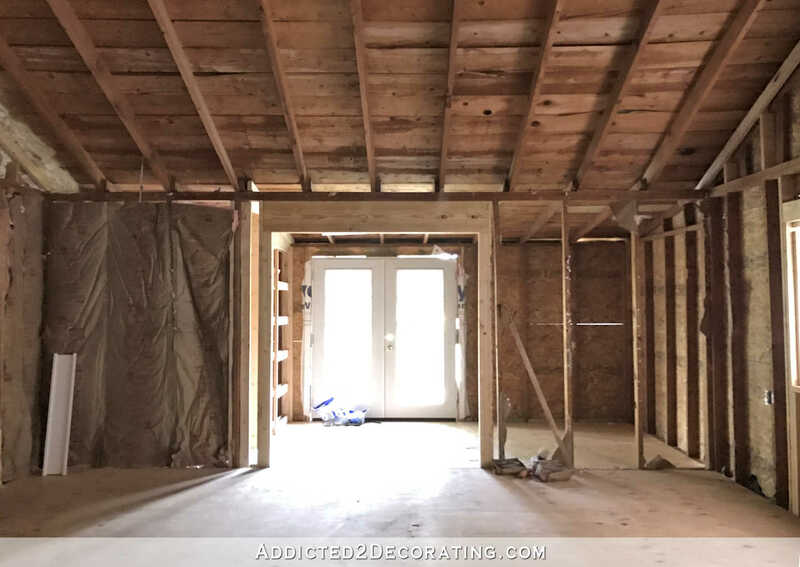 I can’t wait to see it drywalled with the new flooring. So lucky. I’m doing this myself. Will be very makeshift. Just adding insulatin and drywall to walls, then painting. Leaving ceiling for now and will have someone do next year so can be used in winter. Oh, I plan on it. 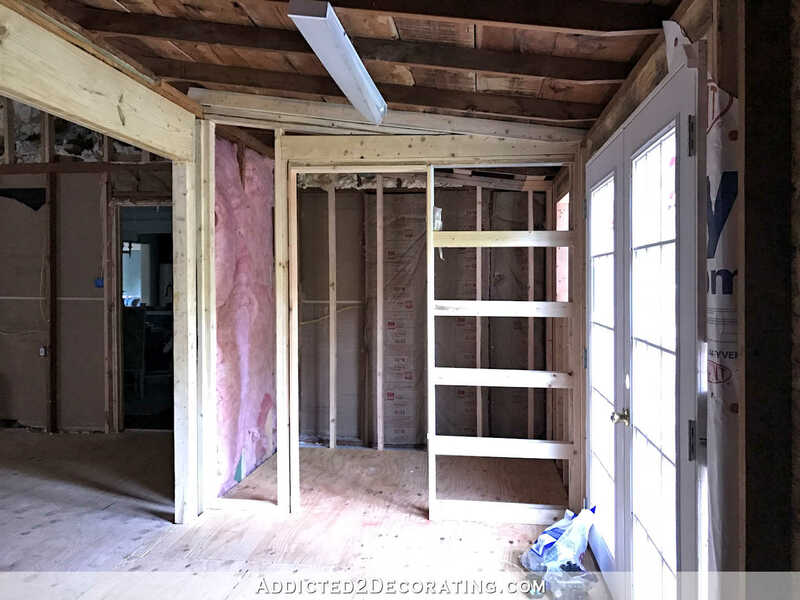 🙂 I’m just going to directly hire the guys who did the drywall for me in the other rooms rather than use the contractor’s drywall people and pay his 20% markup. I am so jealous. the whole place is coming together so perfect.